After the first 20 minutes it looked like Canada was going to walk all over Portugal, taking a quick 12-0 lead and pretty much dominating ever aspect of the game. Then, all of then sudden, Portugal turns it around and goes up 14-12. Canada got 3 back and at the half the result was 15-14 in favour of the Canucks. The second half see-sawed back and forth: Portugal went up 17-15, Canada pulled it back 20-17, Portugal tied it at 20, and then with 5 minutes left the teams exchanged penalty kick attempts. Portugal missed, Canada didn't. And that's how it ended. This was the last of a 4 game European Fall tour for team Canada ending with a 3-1 record, the only lost coming to Georgia, the wins coming against Belgium, Spain and of course, Portugal. At the same time, this was also the third and final game of the Super Bock Rugby Cup, held the last 3 weekends, that saw Portugal come out with a 1-2 record - a loss against the United States, a win against Namibia and of course, today's loss against Canada. 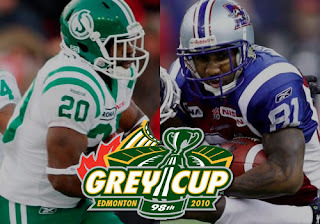 Anyway, it was good fun and tomorrow another Canadian tradition continues - live from Edmonton's Commonwealth Stadium, the 98th Grey Cup pits the Alouetes de Montreal against the Saskatchewan Roughriders. I gotta go with the underdogs - go Riders! of instances prior to I may just get it to load correctly.